Science, Education, Healing, Success and Social reform. Formerly The Sermon. An Advocate of Social Reform / A Monthly Publication of New Thought, Psychic Research and Progress. 1905—1932? Monthly, and then quarterly, May 1919-Mar.-April 1925. Rochester, NY, and then 1915- in Los Angeles, CA. Publisher: Austin Publishing Company. 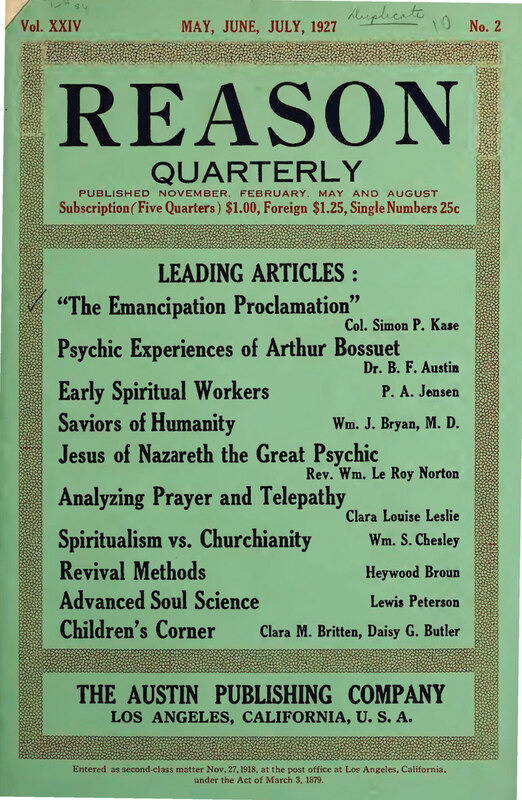 Editor: B.F. Austin, A.M., D.D., Spiritualistic Editor. 1/1, December 1905-1932(?) 42-48 pp. (varies), 4x6. Fifty cents a year.